Wednesday night: Clouds drift by. Lows in the 30s. Thursday: Partly to mostly cloudy, chance PM shower. Night rain. Highs near 50. A coastal storm moves through New England late Thursday into Friday. This brings in the threat of rain south, heavy snow north, gusty wind and a chance for minor coastal flooding. A First Alert is up for the mountains on Friday due to the snow and wind. Before the storm arrives, highs will be in the upper 40s Thursday with increasing clouds. Temperatures stay in the low 50s even through Friday as the low passes over southern New England and drives milder air and tropical moisture in from the south. 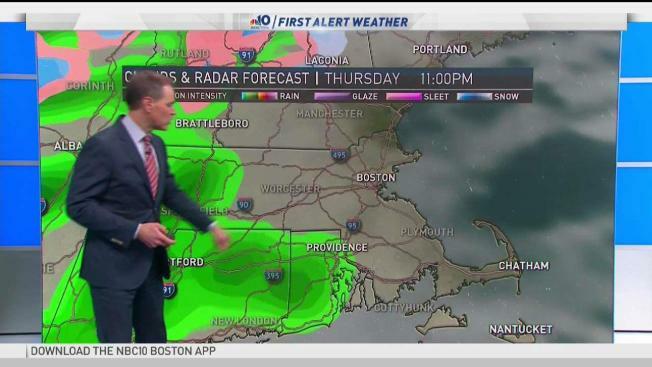 Spotty showers spread in from southwest to northeast Thursday night. Scattered rain falls across southern New England, southern New Hampshire to coastal Maine Friday morning through afternoon. There's a chance for an isolated storm as the warm front lifts northward around midnight Friday. Expect a soggy start to Friday, with lingering showers in the afternoon between dry spots. It will be all rain south, but heavy snow north in the mountains will bring several inches of accumulation through Saturday. High pressure builds in for late Saturday into Sunday, so expect a dry weekend. Rainfall amounts across Connecticut, Rhode Island and Massachusetts will be around 1 inch through Friday night. Localized urban and small stream flooding is possible, depending on where the heaviest rain sets up. Snowfall through Saturday will be about 6-12 inches in the Berkshires, Green, and White Mountains, higher elevations over a foot, less snow in the valleys. The coastal low moves through southern New England on Friday, gusts between 20-30 mph at times. Friday morning along the coast we may see some 40 mph gusts from the south. Once the storm heads away from us Saturday morning, the wind will become strong from the west, with gusts in the 40s which may lead to pockets of damage or outages. Several higher high tides are forecast the next few afternoons due to the super worm moon Wednesday night. Wind direction will be from the southeast for the Thursday afternoon high tide, so we don't expect many issues for that tide, maybe splashover along the south facing beaches. The highest wave heights will be Friday morning with a southwest wind on the south coast, and an east wind on the eastern Massachusetts coast through Maine. Offshore waves about 5-15 feet occurs Thursday night between the highest tides. Friday afternoon may bring the chance for splashover and minor pockets of flooding along the coast with the higher tide. We're still uncertain on when the low moves into the Gulf of Maine to change the wind direction to offshore. The backside of the storm brings in gusty west wind and more mountain snowfall to begin the weekend. Gusts may reach 40-50 mph, with stronger gusts in the mountains Saturday. Snow showers linger there, while southern New England clears out and highs stay in the low 40s. Sunday will be more pleasant with warmer temperatures in the mid-50s and sunshine. Next week will be interesting. A cold front will move through from the northwest and may bring in scattered rain, switching to snow Monday into Tuesday. Colder air accompanies this next system as we go from the 50s Monday to the low 40s Tuesday into Wednesday. Another rebound in temperatures arrives Thursday into Friday, nearing 60 to round out the next work-week.